Miniature horses (commonly called "minis") are popular among equestrians and nonhorse people alike; their diminutive size, cute faces, and sweet dispositions have earned them fans around the world. Many owners of regular-sized horses also enjoy having these ponies around for their affectionate, easygoing companionship as well as for their novelty. Also known as miniature toy horses, miniature ponies, and simply minis, miniature horses have been developed for centuries by selectively breeding horses and ponies of small size from a broad swath of horse and pony breeds. Minis are recognized as a distinct breed, not simply smaller offspring of their parents. Two main registries exist the Texas-based American Miniature Horse Association (AMHA) and the American Miniature Horse Registry (AMHR). In addition, miniature-horse enthusiasts worldwide have formed clubs, registries, and associations to celebrate their shared love of the breed. As with full-size horses, there is a wide range of body types among minis; enthusiasts value both draft and more refined types. Draft types are stocky and sturdy-looking, while the more refined types are more elegant and finely boned than their blockier counterparts. The latter type is more common and closely resembles the body type of its parentage; the proportions are similar, just smaller. 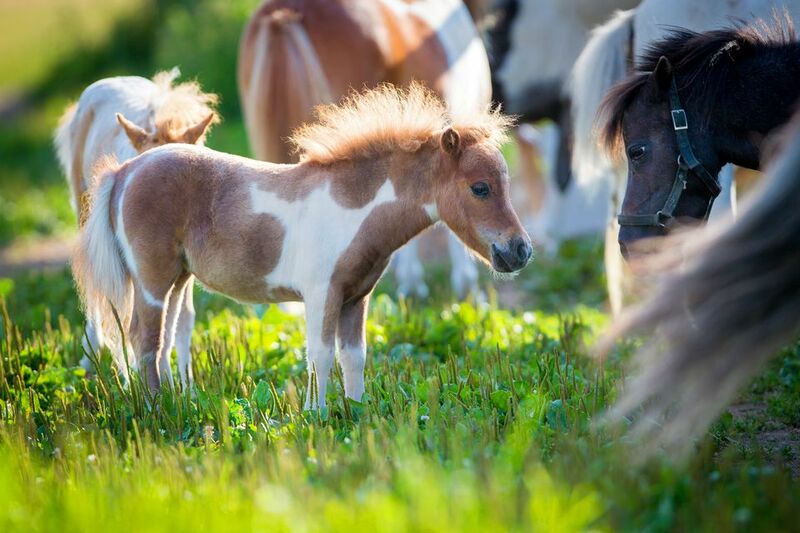 Minis can carry the traits of Shetland ponies, Arabians, Hackney ponies, and many others. In fact, if you were to look at a photo of such a mini that had nothing else against which to reference its size, you might think you were seeing a full-size horse. In general, minis that conform to standards possess the appearance of symmetry, strength, alertness, and agility that are demanded of larger horses. Judges in shows give preference to the smallest possible horse that's nearest to perfection in proportion, carriage, and grace. The forehead is wide, and the eyes are big and set far apart; the distance between them and the muzzle is relatively short. Large nostrils flank a refined muzzle. The ears are pointed and medium-size, with tips that angle inward a bit. The body is lean but muscular, giving the impression of strength and nimbleness. The mini carries itself with all the alertness and pride of even the largest of horses. Mini enthusiasts tend to use inches or centimeters rather than hands to measure. The AMHA counts only horses measuring 34 inches or less among its numbers. In contrast, the AMHR recognizes two divisions of miniature horses: "A" Division minis are 34 inches or less; "B" minis range from 34 to 38 inches high. In any case, some miniature horses are among the smallest equines in the world, and some are record holders. Most minis are too small to be ridden by anyone but the smallest child. Many owners drive their minis hitched to carts, wagons, or sleighs singly or in teams. Both the AMHA and AMHR hold various shows throughout the year, as well as national competitions. Owners can exhibit their horses in show classes, including conformation contests in which the physical traits of the horses are evaluated. Driving, lead-line, costume, obstacle-running, jumping, and various games are among the many performance-oriented competitions in which minis participate. Many of these are similar to trials done with dogs. Minis are frequently used as companion animals to visit shut-ins, the elderly, the differently abled, and people who suffer from psychological issues. As guide animals, they assist the blind and hearing-impaired. There is some controversy as to whether these are suitable jobs for these animals; however, there is no denying their value as companion animals who provide comfort to their owners. Miniature horses come in every color and coat pattern imaginable. You’ll find solid coats, pintos, and spotted coats like that of the Appaloosa. Their coats tend to be a bit thicker than those of full-size horses, and they usually have copious manes and tails. The Mini's small size makes it ideal for keeping on small acreages where there would be no room for a herd of large horses. Easily managed and requiring less food and care than their larger counterparts, the mini is a great horse for the novice owner. Like most ponies, minis are easier to overfeed than underfeed. The Falabella is the most celebrated type of mini. First bred in Argentina in the 1800s, it was brought to the U.S. in 1962. These strikingly beautiful horses descend from Criollo, Welsh pony, Shetland pony, and small Thoroughbred breeds and can be shown, trained for pulling and ridden by small children. Likewise, the South African mini is well known among mini aficionados. It came into existence in the mid-1900s and was recognized as a breed in the late 1980s. It now numbers some 700 in South Africa. Look back in your mini's pedigree, and you might find a sire from this long list of notable stallions compiled by Little America Miniatures. These horses achieved fame in their own right and went on to produce many of the minis enjoyed today. Minis are easy to keep and are as trainable as any full-size horse. Shows featuring miniature horses allow those who would not normally be able to keep, ride, and train a horse the opportunity to enjoy horses and compete. They’re great for kids to handle, as their size makes them less intimidating for small children and timid adults. "Miniatures are well suited for everyone from the novice horse person to the consummate show professional. Their roles vary from backyard pet to fun parade entries to gorgeous show horses to therapy horses for persons with special needs or companions to the elderly. Whatever your interest in horses, it is likely there is a Miniature Horse suitable for the job!" Despite their size, they are very strong and should be trained to be respectful and obedient, just like any other equine.